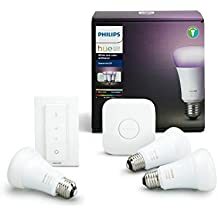 Check out the large range of smart lighting and switches available from amazon such as the Philips Hue range. Smart LED bulbs are controlled from a free app on your smartphone using Wifi or Bluetooth. Instead of providing a fixed colour of light, white changing smart bulbs let you choose anything from a cosy warm white light to a snappier cool white. Pick a white that suits the room or mood. Colour changing smart bulbs use special RGB LEDs to allow an amazing palette of 16 million colours. Select your colour from the app. As well as colour choice, you can dim light, enjoy special effects, create your own custom themes and more.